HOUSTON, July 18, 2011 --Jiffy Lube International, Inc. today releases its new iPhone application that puts convenience and education back into car care by giving drivers the ability to store and organize vital vehicle information in the palm of their hand. Additionally, the "app" arms drivers on the go with tips like how to jump a dead battery, what to do if their car overheats and where they can find the nearest Jiffy Lube location. Jiffy Lube knows drivers are busy and that remembering license plate and vehicle identification numbers (VIN), or when it's time for vehicle maintenance isn't always top of mind. With its new iPhone app, Jiffy Lube provides a simple and convenient place for drivers to keep all of this essential information in one place, easily accessible with additional resources to improve the all around ownership experience. "We developed the app with our customers in mind, aiming to make vehicle care less of a chore by simplifying and organizing information drivers need," said Eric Eurich, retail marketing director at Jiffy Lube International. "The additional features, including tips and store locator, help make this app a great vehicle assistant by bringing vital information to our customers' fingertips." The Jiffy Lube app helps organize consumers' vehicle information while providing easy access to the preventive maintenance information they need to help their cars stay on the road longer. "My Info" puts vital information at drivers' fingertips, keeping them informed in tough situations like an overheated vehicle or dead battery. License plate, VIN, registration, inspection information, oil change intervals and more can be stored and reminders can be scheduled through the "My Info" feature. The "My Garage" feature takes the guesswork out of preventive maintenance by providing tips and basic information -- based on vehicle manufacturer recommendations. This feature helps users stay in touch with their maintenance schedule and even set their own reminders. 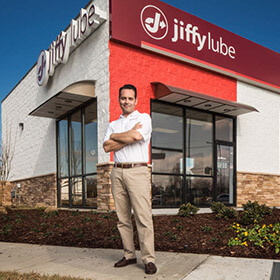 The GPS-enabled Jiffy Lube locator and "quick call" feature make it easy for consumers to locate and contact the nearest Jiffy Lube, from wherever they are. These features also inform users what services are performed at particular locations, if there are any coupons available and the ability to share coupons with their Facebook and Twitter networks.